Analyse the marketing opportunities and challenges faced by a selected business when using internet marketing within its marketing mix. Tescos. 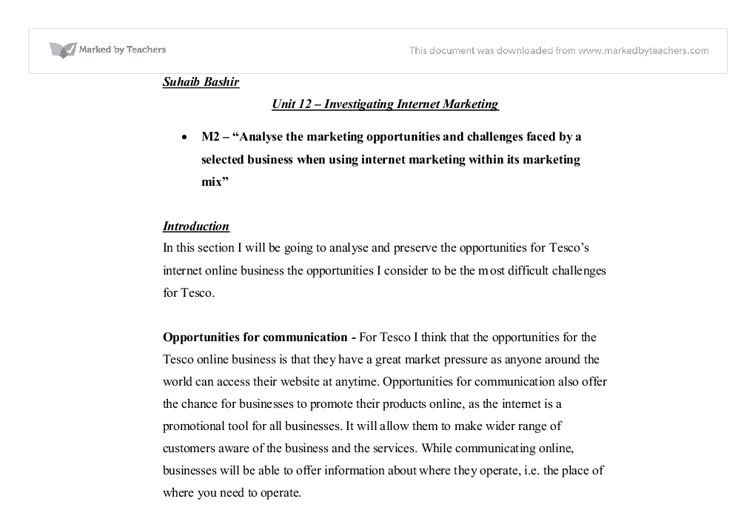 * M2 - "Analyse the marketing opportunities and challenges faced by a selected business when using internet marketing within its marketing mix" Introduction In this section I will be going to analyse and preserve the opportunities for Tesco's internet online business the opportunities I consider to be the most difficult challenges for Tesco. Opportunities for communication - For Tesco I think that the opportunities for the Tesco online business is that they have a great market pressure as anyone around the world can access their website at anytime. Opportunities for communication also offer the chance for businesses to promote their products online, as the internet is a promotional tool for all businesses. It will allow them to make wider range of customers aware of the business and the services. ...read more. Another opportunity for Tesco is to create a comment box where customers can rate and comment on a certain product which was purchased for example this will guide customers in which products are highly rated by other customers and who share the same views as customers will mainly purchase from Tesco if products are preferred by other customers and if ratings are high fro that certain product. Challenge of maintaining security - The ways Tesco can overcome this is by placing a firewall which protects data or also hire a trusted and responsible member of staff to monitor data flowing in to the computer and also another way Tesco can overcome this is by placing an anti virus which blocks attacks from hackers and also deletes any viruses which may steal data. ...read more. Challenge of delivering to expectations of higher reliability - The way Tesco can overcome this is by either delivering the product with a quick delivery service, also another way is to have a tracker on the product in which customers can know if the product is dispatched so the customer is ensured they will receive the product in the number of days the business has given. Challenge of possible linguistic and cultural sensitivities - The way Tesco can overcome this is by creating a new language bar as users can simply click on the language given and this automatically translates in to the person's language another way is to have a translator for each product instead of reading the product customers can simply click on audio translator and select language and this automatically describes the product in the chosen language. ?? ?? ?? ?? Suhaib Bashir Unit 12 - Investigating Internet Marketing ...read more. The cost of conducting the research may be an important factor in deciding which methods to use. Some of these methods can be very expensive and many start-up companies may not be able to afford to use all the methods they would like to. I will be familiar with what customers want from a day at Thorpe Park, how I can increase the number of people visiting the park and what would improve Thorpe Park. Thorpe Park Questionnaire What area do you live in? athletics, football, basketball etc) * Schools, colleges and universities * Leisure or youth centres The main market for GlaxoSmithKline would be the United Kingdom as Ribena is predominately being sold the UK but with the flavour it could also hit the global market providing for leisure centres and schools all over the world. Products: This includes the types of products Tesco sells and how Easyjet provides for customers, for example Tesco provides good products and house equipments whereas Easyjet provides customers with good deals on tickets. Prices: This includes the prices of the products sold, or the prices that Tesco and Tesco set to sell their products/services. Also on ww.nike.com they have the option to customise products like trainers so customers would be able to choose exactly how they would like and they would be able to view the product online once the customisation is finished. E - Price Strategies The way that most websites put their prices is cheaper than the ones in the shops. 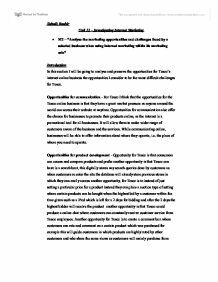 Evaluate the effectiveness of marketing techniques in Tescos. To serve its widening markets it needs flexible and well-trained staff that can recognise the needs of the customer. Sales: Five year summary: The sales figures show that how Tesco have performed which is really good in terms of the hardship that they have faced during the recession.